The first radio disc jockey was Hollywood music store owner Al Jarvis, born Eliyash Yavois in Birzai, Lithuania in 1909 to Shleyme Yavois and Nechama Zelbovitz. Nechama’s father Lipman Zakharia is the earliest known ancestor of that branch of the Zelbovich family; he and his wife are buried in Winnipeg. Walter Winchell invented the term “disc jockey” in 1935 to describe Martin Block, who borrowed the “Make Believe Ballroom” format from Jarvis. Note the reference to that borrowing in the poster below. 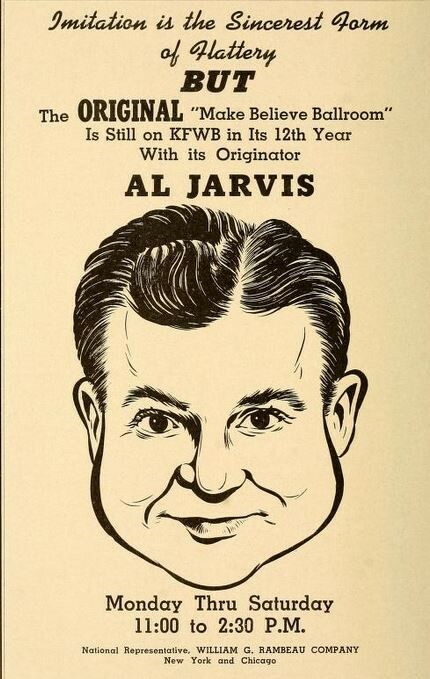 A good article on Al Jarvis’ career at KFWB is located here.